LOCATION...LOCATION...LOCATION... centered in Orlando's SODO District. The SoDo District is a thriving urban business district surrounded by many of Orlando's historic neighborhoods known for their lakes, walkable parks and streets filled with activities such as free concerts and film festivals. Walk to nearby shopping and close to the Orlando Regional Hospital. 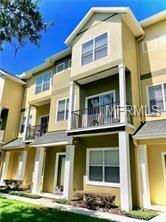 Just South of Downtown Orlando (hence...SODO), access to everywhere is convenient! This beautiful three story townhome offers two master suites on the 3rd level and a 3rd bedroom or office/den on the first. A full 2-car garage with private rear access and entry to your home via garage door remote. The main floor features a kitchen open to the family room and a separate formal dining room. Both family room and dining room offer private balconies. Make this your home in the NEW YEAR! Applications are available on our website or contact your Realtor for a viewing today. Listing provided courtesy of Claire Schwartz & Associates.